American brand perforators have been around for over 100 years. Perforators are used for many different types of document marking applications – from invoice canceling, mail dating, mail receipting, X-Ray dating, ID voiding, credit card cancellation, general document numbering and a variety of other uses where multiple documents need to be marked. Perforation is an efficient way to mark many documents at a single time. The holes used are permanent and cannot be changed, removed or altered. Time savings alone in many cases will pay for the perforators cost in a year or two! Our perforators are NOT the type used to create straight line perforations to make tearing off a sheet from a pad easier. 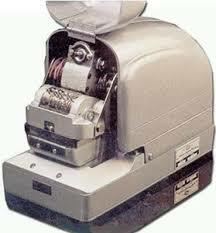 Our machines are designed for inscribing numbers and/or characters into documents primarily. The machines are very fast and built go be heavy duty. Most of the moving parts we have inside our perforators are sealed inside of a cast metal housing, leaving very few moving parts on the machine that can be repaired in the field. Because we have been shipping our machines all over the world (even into some countries that are really off the beaten track so to speak) for many, many years, our design was, by necessity, one of being very rugged and as simple as possible to maintain. American brand perforators all come standard with a one year Factory Labor & Parts Warranty against defects in workmanship or parts. If you ever need to return your perforator to the factory for repair or refurbishing, you can be assured that our factory personnel give customer perforators sent in for repair top priority. For permanent document marking applications, check out our perforators first. Contact us today for your perforator quotation. We will be happy to assist you.